Just one year after planting papaya seeds, you could enjoy a taste of the tropics whenever you want with home-grown papayas. Papaya plants grow quickly, given the proper care and a warm climate. The plant has one main trunk and grows large leaves out of the top, similar to a palm tree. The papaya fruits grow on the trunk of the tree, just below the leaves. Plant papayas only if your temperatures rarely, if ever, drop below freezing, because frost damages papaya plants. Plant papaya seeds to grow fruiting trees within as little as a year. Open a ripe papaya fruit, remove the black seeds and place them in a colander. Rinse the seeds under cool running water and rub them to remove the gelatinous material coating the seeds. Fill a 5-gallon pot with sterile potting soil for each papaya plant you would like to grow. You need at least three plants to guarantee that you will have a mix of male plants for pollination and female plants to produce fruit. 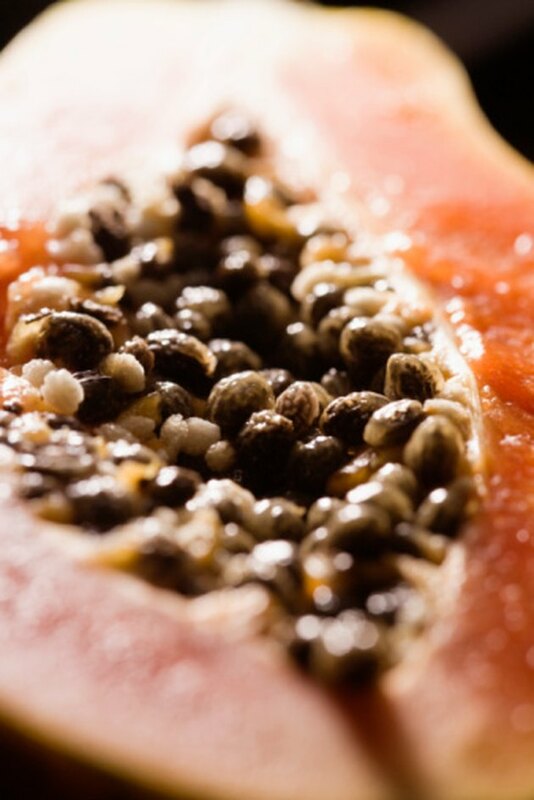 Plant three to five papaya seeds in each pot, about 1 inch deep and 3 or more inches apart from one another. Set the pots out in an area that receives full sunlight. Wait two to five weeks for the seeds to germinate. Choose your outdoor planting site, which should be in full sunlight and in a warm area of the yard. Planting on the southern side of a house helps with reflected sunlight and shelter from the wind. Incorporate compost and peat moss into the soil at each planting site with a shovel. Planting sites should be spaced about 8 to 10 feet apart from each other. Dig a hole at each planting site and gently plant each pot of seedlings in a hole. Wait until the seedlings begin flowering, at about five to six months old. Identify female plants, which develop large flowers directly out of the trunk and male plants, which develop sets of small flowers growing on branched stems from the trunk. Cut back all but one seedling at each site, keeping mostly female plants and at least one male plant to pollinate every 10 female plants. What Type of Papaya Tree Do I Have?